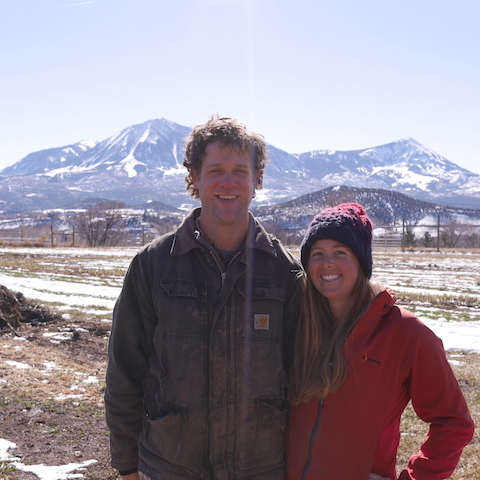 Kristin Gross and Eric Just own and operate Twisted Root Organic Farm in Paonia, CO. With Lamborn Mountain as a sweeping backdrop, they grow beautiful Certified Organic vegetables all year long. 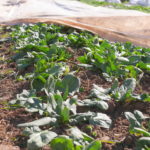 At first glance, there’s not much to see on a vegetable farm in early March. Like the rest of the landscape that surrounds them, Twisted Root Organic Farm is a palette of tans, muted browns, and patches of snow on the day I visit. But with a closer eye to detail, signs of life are all around. 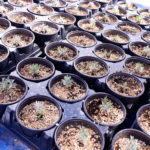 Inside a large greenhouse, the smell of warm dirt makes you forget that the ground outside is frozen. 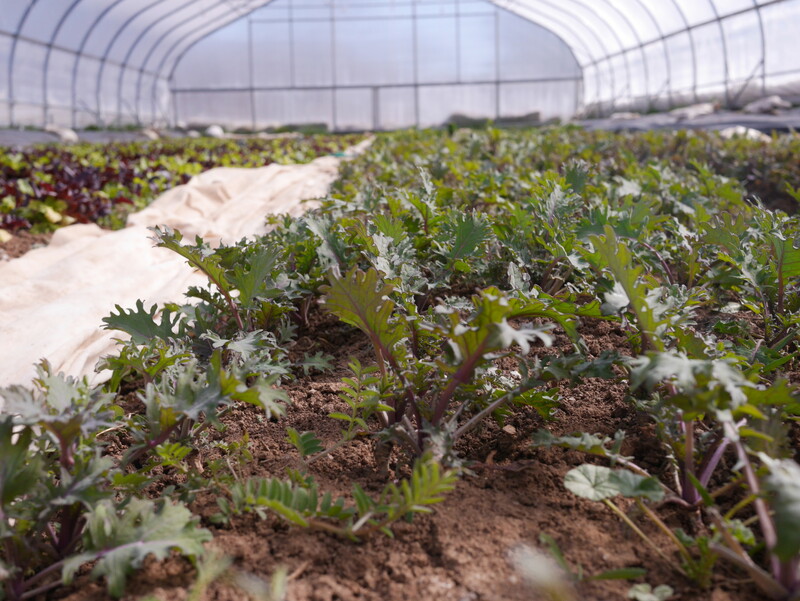 Rows of salad greens and baby kale, planted way back in September, lie close to the ground, soaking up the passive solar energy. Outside, more greens are tucked in tight underneath white row cover to protect them from the cold. And beneath what appears to be just dead leaves, glowing orange gems of carrots wait patiently to be dug from the ground. Now in their third year of operation, Kristin and Eric have transformed their little piece of land into a highly productive farm. 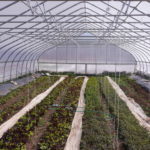 Even though they own about six acres, they prefer to keep their vegetable plot to just about two acres. That size allows them to do most of the work by hand (although Eric is pretty excited about his new Kubota tractor) and not have to rely on much outside labor. In addition to produce, Twisted Root is also home to a flock of laying hens and resident farm dog Elko. 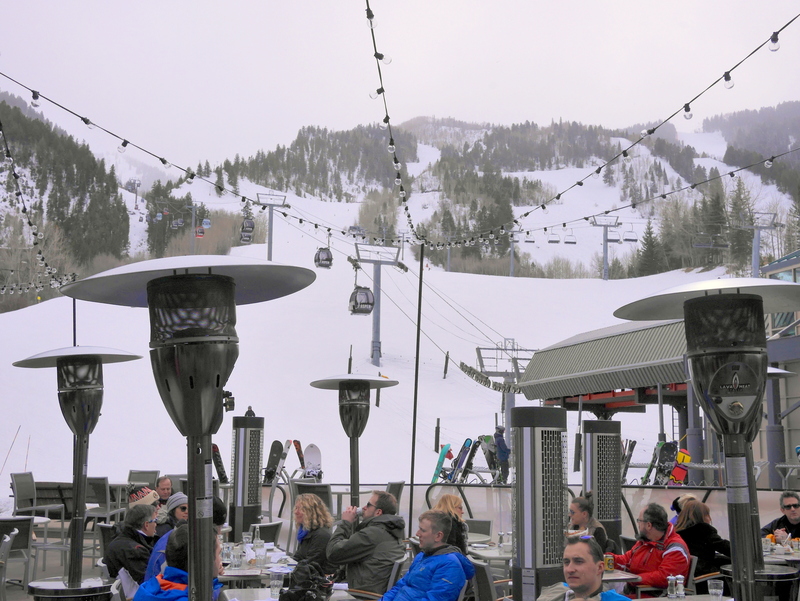 As the snow melts and signs of spring return, Kristin and Eric are busy inside planning for the season to come. 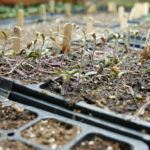 Underneath grow lights in their laundry room-turned-plant nursery, tomato seedlings sprout from trays of potting soil. 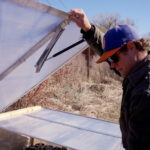 Underneath the cover of a recently moved greenhouse, a new patch of ground gets dried out, warm, and ready for the next succession of salad mix. Eric eagerly awaits the return of pepper season–his favorite crop to grow and harvest. 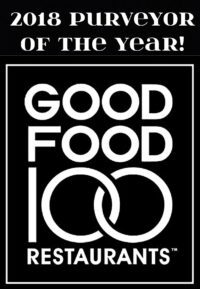 In every season, look for Twisted Root products on the Farm Runners list. When summer farmers market season comes, you can also find their veggies and eggs at the Crested Butte Farmers Market.